Below you’ll find our free printable 4×4 Halloween Bingo. This game and all the rest of the printables on our site are original, exclusive, and best of all – free for your personal use. The Bingo rules are quite simple. Each person gets a bingo card (we have 3×3, 4×4, and 5×5 Halloween bingo cards for you to print). Each of these bingo cards is different and has a random selection of pictures (we have 40 different cards). A caller pulls out little pictures from a hat or container (these pictures are the ones on the bingo call sheet, which you print and cut out), shows it to everyone and describes it. When someone finds a matching picture on their Halloween bingo card, they mark it out with rocks, pennies, stickers, etc. Once someone is able to fill out the predetermined pattern, that person yells out “BINGO” and wins a prize. There are many different combination patterns. It would be best to have a rule that each person can win only one prize (you can have different prizes for a different combination; a prize for blackouts, a prize for lines, a prize for T’s, etc.). Sometimes in a game, two people can combine a pattern and win the same prize at the same time. In this case you can play “rock, paper, scissors” or draw straws to determine who gets the prize and who keeps on playing for the next prize. 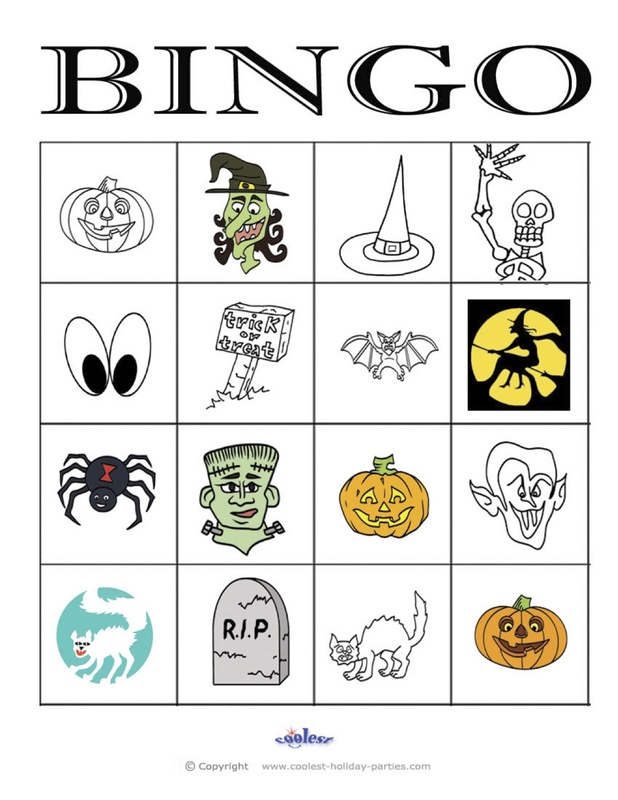 You can also make this Halloween bingo game educational. For example – the caller picks out a pumpkin picture. All the people who have that pumpkin picture get up and gather into a group. The caller asks them any type of question (best if it has something to do with Halloween – check out our Halloween facts page for question ideas. Questions can include anything relevant to the age group – could be spelling, history, math, even something physical they need to do – like hop on one foot, etc. ).